Thaw shrimp, if frozen. Peel and devein shrimp, leaving tails intact if desired. Rinse shrimp; pat dry with paper towels. Drizzle with lemon or lime juice; sprinkle evenly with seasoning salt. While squash is cooking, lightly oil and heat a cast-iron grill or griddle to medium-high. Grill for 3-4 minutes on each side. You want to achieve grill lines, but be careful these cook quickly and will be tough if overdone. After cooking, feel free to sprinkle additional seasoning salt over shrimp for added flavor. Take squash out of the oven. Scrape out all the strands of spaghetti using a fork, place spaghetti squash in a colander in the sink, pressing gently with a paper towel to allow excess water to drain out. Transfer spaghetti squash to a serving dish, fluff with a fork and add a drizzle of olive oil and salt and pepper to taste. 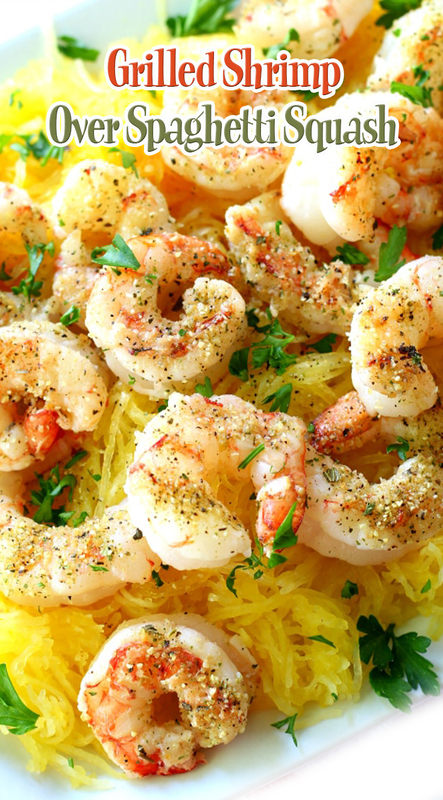 Serve shrimp over spaghetti squash and sprinkle chopped fresh parsley over the top. Enjoy with a glass of Santa Rita!